Fires affecting natural landscapes (natural forests, bush/shrub land, range lands, peat lands), cultural landscapes (industrial plantation forests, open land ecosystems such as anthropogenic grasslands / pasture lands, other agricultural lands), protected areas and urban-industrial landscapes. The Thematic Working Group C ‘Vegetation Fire Crisis Mitigation’ held the first workshop in Berlin. 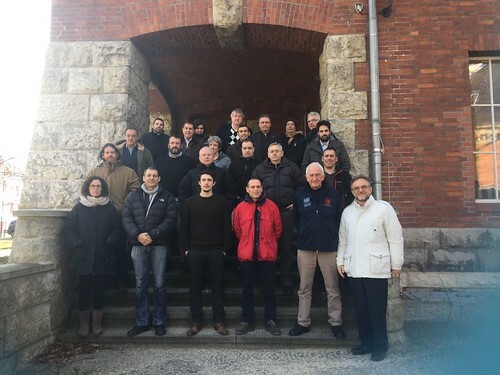 The workshop was hosted by the Federal Agency for Technical Relief (Bundesanstalt Technisches Hilfswerk – THW) and organized by the Global Fire Monitoring Center (GFMC) with support from the Catalan Fire Service (CFS), the Pau Costa Foundation (PCF), the Swedish Civil Contingencies Agency (MSB), and the Center for Security Studies (KEMEA) as well as the FIRE-IN coordinating body – SAFE Cluster). Twelve associated experts from 11 countries across Europe (Portugal, France, Croatia, Spain, Greece, Italy, Hungary, the Former Yugoslav Republic of Macedonia, the United Kingdom, Sweden, Germany) joined the workshop. The experts contributed a broad range of fire management expertise, including geographical and climate diversity, and represented practitioners but also the thematic overlap of academia and civil protection. The group of experts discussed different fire management perspectives on challenges from across Europe, including fires in open landscape, fires burning in terrain contaminated by unexploded ordnance and radioactivity, explosive fires in peri-urban areas, as well as arson. They also identified the gaps in fire and rescue service’s capabilities using two hypothetical scenarios: (1) landscape fire crisis mitigation (response) and (2) landscape vulnerability mitigation (policy, prevention and preparedness). The feedback from the participants was very positive with regards to both the highly hands-on workshop as well as the content and format.